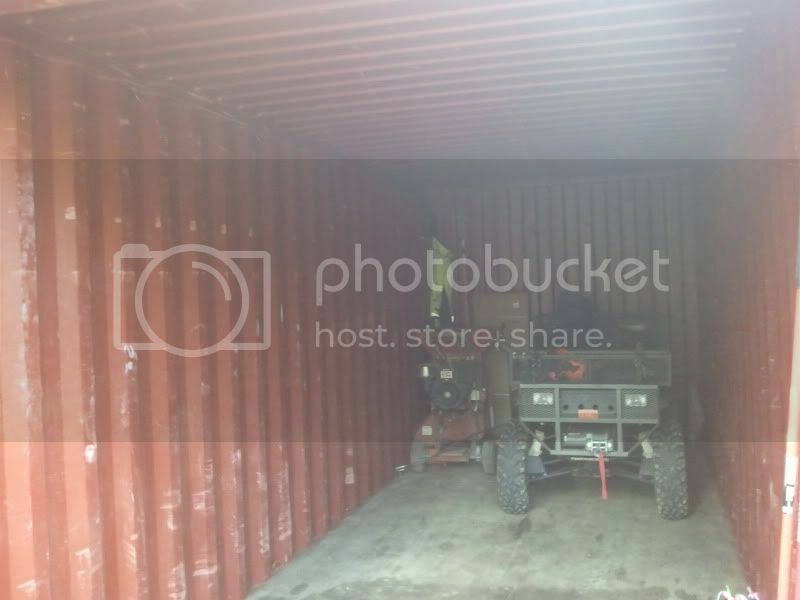 What's the latest idea on prepping a shipping container to be buried? I'm building a livestock/multi-purpose barn out of 3 shipping containers (in kind of a U configuration) with a roof over the top of them, and burying a 4th under one of the shipping containers as a root cellar/cheese cave. I figure that by putting one shipping container on the roof of the buried one kind of solves the problem of the collapsing roof theory as no weight will be on top of the container other than on the reinforced corners, and I live in a desert so I'm not too worried about water damage and flooding, but I still need to address metal corrosion and possible lateral collapse. So I guess this is a 2 part question. 1. For rust/corrosion, what should I use to paint the outside of the buried container in before I put it in the ground? Just a rust proofing paint? Something like: http://www.rustbullet.com/? Or what have people used that has worked for them? 2. Also, what's an affordable way to prevent the side walls from bulging in? Reinforce the insides with lateral wood or steel? Horizontal wood or steel? Or reinforce the outsides with steel, treated wood, railroad ties, etc? I guess I have some ideas but am curious what has worked well for other people and what lessons they've learned from doing this. Thanks so much! Re: What's the latest idea on prepping a shipping container to be buried? Found this site with an interesting youtube video showing the steps one guy took to prep his container. Pretty neat video if you can get past the music. Yea that guy's set up is pretty sweet. He has a lot of reinforcement built up. Does anyone know of a good spray on "bed-liner" (for lack of a better word) type of material that could go on a container that would keep water and rust from getting at it? My guess is for the sides we should probably be fine just putting vertical steel on the outside every 3-4 feet (I hope). I'll look into tnemic products and shoot them an email. I wonder if a rust inhibiting paint is enough to keep it from rusting out, or if it needs to be a thicker tar, spray foam or bed-liner type product. I heard someone say that the high priced flex seal was just cheap spray-on car undercoating with lots of marketing hype. Why can't you use commercial mastic on a container, like what's used on new basement construction? Isn't that available in a spray tank? Most shipping containers are made with a material called Cor-10 steel. It is very corrosion resistant. Most corrosion paints are very toxic and require special handling. If it were me I would contact a contractor that sprays concrete foundation walls before back filling. In the case of the container you could probably have them shoot the bottom, roll it over and shoot all the sides and top before you bury it. After digging around a bit I think you could definitely eliminate that flex seal stuff (not a big shocker I know). Reviews were horrendous from what I could tell. I'll look into the mastic and also concrete foundation spray. If I had 10 seconds to make a plan (and before looking into your suggestions heavily), I guess I'd probably roll it on it's side, paint the bottom with Por-15 or Rust Bullet, and then paint each of the sides the same way, and finally tie a handful of sacrificial zing anodes to it. And I guess if you were really worried you could pour a thin layer of concrete between the dirt and the container, or maybe spray on an inch of insulating foam to keep the dirt and water off of it. I have been thinking of putting a 20 footer in the ground for a long time. Here the bedrock is only about 4' deep, so I thought I would dig the hole, put gravel in the bottom before setting it and then gravel the sides and one end as we fill it in. My plan is to leave the other end open and have the ground leveled off to be even with the hillside. I would also tilt the grade slightly and that would allow the run off to drain through the gravel and out on the open end. Then I would mound up on the sides and leave about 2 feet with just the container showing on three sides. Then I would put some kind of roof or cover, for an air space, as to control the temp in the summer. I want to use it for a root cellar and storm shelter among other things. My dad lives here on the place and is wheelchair bound, so a typical underground storm shelter with stairs going down is not usable to him. Yea that sounds like a good plan. Gravel on the bottom is probably a must I would think. How about burying a reefer (refrigerated unit) shipping container with the theory being that it's made out of aluminum and wouldn't rust as easily? I don't think it's necessary but in all my digging I saw that someone threw that theory out there and it seemed like a good idea. Just my 2 cents, remember that most conex/shipping containers have a thick wooden floor so beware of the floor rotting out if not sealed somehow from underneath. I know cause my 20 footer has one. What about roofing tar as a coating? The problem I see with burying a steel container is corrosion. You can use whatever coating you want, but sooner or later the soil will wear through the coating and galvanic processes will cause corrosion. The video example is the best example I've seen of burying a container without burying it. The Doomsday Bunker guy will have the same problem with his steel bunkers if he doesn't employ some sort of cathodic protection. You should use Culvert Coating or possibly spray on undercoating/rinoliner. http://www.dissco.net/products/products.asp?590.txt this Coating is a mastic designed to be applied to buried metal pipe and can be sprayed. serious heavy duty stuff. I'd spray cold galvanizing paint/trailer frame paint on any bare or thin spots the coat with the culvert coating. then use could add anodes as needed. Cathodic protection: If you were going to use sacrificial anodes for a 40 foot container, about how many and what size would you want to use do you think? And about how long do you think they would last? It would be nice to be able to replace them after X amount of years I guess. http://www.dissco.net/products/products.asp?590.txt : I don't think that's a bad idea at all and thank you for a link to a product! You would need to cover something like 1200 square feet of metal if I'm doing my calculations right, and at 6 gallons for 100 feet, that seems like a ton of material. I wonder what that would end up costing. That's probably going to be the reality of painting a shipping container, no matter what material you ended up using. And trust me, I've listened to that podcast a half dozen times =) It was encouraging to hear the guy basically sound like it wasn't a huge deal to rust-proof the things. I wonder how well rustoleum would do and how much it would cost to coat an entire container. NAPA used to sell this stuff dont know if the still do but it used to be called 395a , black rust proofing carframe type stuff takes heat cold water and everything else and ignores it. You would have to roll it or brush it but it dont come off.....use that for under ground I would use a lighter color exterior paint for the above grounds to keep the animals cool in summer. Thanks devildoc, I'll look it up! Someone just mentioned to me that they buried a container and kept it watertight by wrapping it in 3 layers of thick plastic. I thought that was genius! A plastic bag doesn't disintegrate for 500-1000 years (according to a quick internet search). I guess you'd have to find a source for giant sheets of thick plastic wrap but that seems possible, It would also have to be watertight so that water didn't seep in through the layers but that seems possible as well. I'm definitely feeling like this is possible though. If you REALLY wanted to be waterproof you could use a bedliner type material, and then wrap the entire thing in plastic. You'd be darn near invulnerable from water at that point I would guess. Of course the other thing to consider is the level of your water table. If you have a very shallow water table, I don't think you'll be able to seal the water out permanently no matter how hard you try. However, if you have some natural slope to work with, a deep water table, lay a well drained gravel bed, and can put in a layered system to keep surface water away, I don't see any reason you'd ever have a problem even in the wettest of years. Personally, I'd use something like a car undercoating, bed liner or a concrete coating (the paint on tar to prevent basements from leaking), then gravel with french drains, a layer of landscaping plastic, a layer of soil that slopes away from the container 1-3' thick, then another layer of plastic before putting your surface soil on. Even if each layer has some compromise in it, the amount reaching your container wall will be nominal and easily drained away. Thankfully we've got to drill ours wells to about 400 feet with a 70 foot static level. We get less than 10 inches of rain here a year so are officially a desert. By the time you purchase the shipping container, prep it for corrosion etc etc and go through all the labor and expense, is it actually cheaper than the "DOOMSDAY BUNKERS" they are selling in those Natty Geo channel "infomercials" LMFAO? Well I sure hope so. I think you should be able to do it for under $5,000. What are your opinions on POR-15 vs. Bitumastic 300 M? I've heard people suggest POR-15, and the guy who sold us a container suggested the Bitumastic. Basically it's a super water-proofing paint vs. a coal tar epoxy. You could coat one in POR-15 for about $500 vs. about $1,000 for the bitumastic. Does anyone with any experience with either product have an opinion? For some reason I'm leaning POR-15, but the coverage is only about 3 mils vs. about 20 mils for the bitumastic. I'm not sure if that matters or not though. Like said before unless your water table is high I wouldn't worry about any coating myself. Just keep the water away from it to begin with, I would add a roof type design like the guy did in the video but not put concrete over it. I would lay steel roofing over the top to direct the water away, have a good gravity drainage system or sump pump if you have too. Personally if I needed a pump I wouldn't do it. Fill the sides in with a light weight crushed rock, or reinforce with smaller steel beams or round sprinkler pipe. We've looked at this concept extensively from engineering perspectives and also the internet forum rumors. Personally, our best option (maybe different in your location) is to build rammed earth tire walls all the way around the container, set it on a deep gravel french drain, and roof it with steel I-beams and concrete. When finished it will basically be a container sitting in a bunker. All the weight is off the container (top and sides), and there is no soil contact at all. It also gives us usable space around the container for "stuff". You may want to consider this approach, as the money you can save (coatings and reinforcement) can go into other items. One thing to be concerned about is the load from the earth on top. Shipping containers have strong columns on the corners that are designed to hold the containers above. The roof is not designed to support weight. The beams accross to support weight are found on the bottom. Please be cautious with the roof weight. A system of beams goings from corner to corner or something coming up from the sides to support the weight is necessary. If you put three feet of soil on this and it works fine, let me know, but I would be surprised. Flippydidit has a good way to get around this, but I wonder- If you are going to do that, why have a container at all? The purpose for the container with this approach is to have a structure that easily lends itself to a living area. It's able to be secured, can quickly be wired/plumbed, and has "walls" and a "roof" to make it more like a "room". The benefit of doing it this way is to save on pouring steel reinforced concrete bunkers. It also allows you connect the containers as an underground network without wasting TONS of money on concrete and steel. It appears to be quite safe, even with the soil load becoming saturated with water. It can be designed to shed water without money being spent on liners and coatings. Any water that does make it in would be drained down into the french drain. Additionally, we plan on building this more or less at ground level and "berming up" the sides of the tire walls. The soil excavated out of the french drain will be used for this fill. Any additional fill we will bring in from the creation of our ponds that are part of our permaculture plan. Above these containers we would put in gardens and another structure with the ability to collect rainwater. Being above the containers will give us a gravity feed system. Tagging for updates. I'm looking at using 3-4 40" containers above ground as a permanent home.